How to Make Money From Snail Farming - Pen & Hutch Boxes - Haba Naija! Stocking The Pen: The best source of parent stock is from the wild. 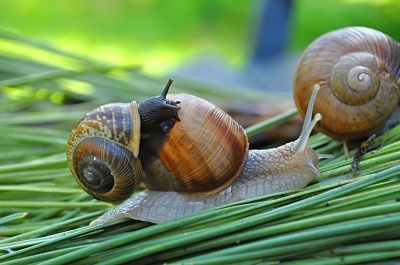 Reason is that snails fresh from the wild are vigorous and disease and stress free. Getting snail from the wild can be contracted out to poachers if you have the time, here is the trick. Get good quantity of ripe and almost rotten plantain or pawpaw; pour it in strategic locations in virgin forest, or cocoa farm at about 5:00pm. Go back there about 8:00pm – 9:00pm with good torch light. I am sure if snails are nearby you will pick a good number. Another source is to buy breeding stock from existing farm. Note, breeding stock should not be bought from the open market. The snails in the open market are subject to dehydration and loss of fertility, stress and transportation hazard, cracks e.t.c. some may even die after introduction into the pen. Care of Snail: Feeding of snail should be regular. Snail feeds on vegetables, leaves, fruits and decaying organic matter. Food waste like maize bran, wheat bran is also good to feed snail. Food containing water in shallow trays. Food should be rich in calcium and essential minerals salt should not be fed to snail. Snail can also be fed on balanced poultry ration for proper growth. When feeding snail the farmer should take time to watch the activities of the snail. Remove dead ones. It may be necessary to irrigate snail farm regularly during the dry season or else the snails will hibernate. But if there is constant supply of water and food they will be active during the dry season. If there is drought, snails can hibernate even up to 2 years in case of desert snails. However, they become active immediately favourable condition returns pawpaw, cocoyam, banana leaves, waterleaf and sweet potato leaf can be fed to snails. Reproduction: Snails are very prolific layers. Achatina achatina lays up to 300 eggs up to 3 times in a year. Snails are hermaphrodite and capable of self-fertilization hence most of the eggs laid are fertile and often incubate and hatch into baby snails. After hatching, care should be taken to prevent overcrowding. The stocking density should not exceed 30 snails per square meter. Conscious effort should be made to remove dead ones and feeding should be regular. Pests: Termites, Lizards, Snake, Soldier ants are the common enemies of snail and should be prevented at all cost. Domestic birds like chicken, duchess gees and turkeys should be prevented for they feed on baby snails. Diseases: There are not many diseases identified in snail but fungus and bacterial diseases which are spread by contact has been noticed in overcrowded pens. There is presently no identified disease of snails in the wild though it is discovered that some snails are alternative hosts to some diseases that affect humans. There are some ethnic groups in Nigeria which see touching snails as taboo and sacrilege. Idoma and Egede clans in the middle belt of Nigeria highly forbid snails. However, there is high demand for snails in the southern markets and they are sold in the open markets. A matured snail costs not less than N 200 in Lagos market and minimum of N 120 in the Ibadan. Wet season and more during the dry season of December to April. Harvesting of snail. Maturity takes 2 years. Only matured snails should be harvested. To identify matured snails is not hard. Check the brim of the shell. For matured snails, the brim is thicker and harder than other parts of the shell. It does not crack or brake when pressed with land. This signifies that the snail has reached its maximum size and cannot grow more than that. Do not harvest all the matured ones for the market. Keep a little for breeding and to serve as base stock. Nevertheless very old stock should be taken to the market. Care should be taken not to crack the snails during transportation to the market. A prolific snails is expected to have produced up to 500 baby snails during the rearing period of 2 years. So you can imagine how profitable the venture is. If you stock 1000 snails you will have at least 500,000 snails in two years under good management. That was a very nice article. How can one get more details on this business especially the Marketing aspect. have a look at the post ElyJay made about marketing snails here, excerpt from his response: Marketing of Snail does not pose much problem, because it sells like hot cake. In Nigeria local markets. Harvesting should be done during the dry season between December and March. By this period there is no competition from the Snails caught from the bush.